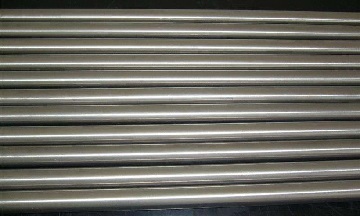 Grade 12 titanium seamless tubes made to ASTM B338, size: 25.4 mm(o.d) x 2.0 mm(w.t) x 3600 mm(l). Designated as UNS R53400, titanium grade 12 has the nominal composition of Ti-0.3Mo-0.8Ni. It’s a titanium alloy that may be treated as unalloyed titanium (commercially pure titanium) with minor traces of alloying contents. Compared to commercially pure titanium (grade 1, 2, 3, etc), the nickel and molybdenum alloying contents result in improved strength and better corrosion resistance. Although its corrosion resistance is not as good as grade 7 titanium (titanium-palladium alloy), grade 12 titanium is much more cost-effective. Generally, titanium grade 12 materials are furnished in annealed condition. It is particularly resistant to crevice corrosion in hot brine, however, cautions must be taken when it is used for solutions with pH value less than 3. The microstructure of grade 12 titanium is near α phase, which is either equiaxed or acicular alpha with minor amount of beta. Titanium grade 12 is primarily used for chemical processing and seawater applications requiring moderate strength and enhanced corrosion resistance such as heat exchangers, pressure vessels, chlorine equipment, nuclear power plant, and salt evaporators. Grade 12 titanium finds its use with media either mildly reducing or vary between oxidizing and reducing. For ASME Boiler and Pressure Vessel Code services, titanium grade 12 is not permitted for Section I and Section III, but is applicable for Section VIII Division 1 and Division 2 and Section XII with maximum temperature limit of 600°F. *All values are in wt. %; *OEE: other elements, max. each; *OET: other elements, max total. *Tensile tests shall be conducted at room temperatures; the material shall be in annealed condition. ASTM B265/ ASME SB-265 Gr.12: plate, sheet, strip. ASTM B338/ ASME SB-338 Gr.12: seamless or welded tube. ASTM B348/ ASME SB-348 Gr.12: bar or billet. ASTM B363/ ASME SB-363 Gr.WPT12: seamless or welded fittings. ASTM B381/ ASME SB-381 Gr.F12: flanges or other forgings. ASTM B861/ ASME SB-861 Gr.12: seamless pipe. ASTM B862/ ASME SB-862 Gr.12: welded pipe. *Temp. : metal temperature, °F, not exceeding; MAS: maximum allowable stress, ksi. *MAS-1: maximum allowable stress applicable to ASME BPVC Section VIII Div.1 & XII for grade 12 titanium materials of ASME SB-265 plate, sheet, strip, SB-338 smls. tube, SB-348 bar & billet, SB-363 smls. fittings, SB-381 forgings, SB-861 smls. pipe. *MAS-2: maximum allowable stress applicable to ASME BPVC Section VIII Div.1 & XII for grade 12 titanium materials of ASME SB-338 welded tube, SB-363 welded fittings, SB-862 welded pipe. *MAS-3: maximum allowable stress applicable to ASME BPVC Section VIII Div.2 for grade 12 titanium materials of ASME SB-265 plate, sheet, strip, SB-348 bar & billet, SB-381 forgings, SB-338 & SB-861 seamless tube & pipe. *MAS-4: maximum allowable stress applicable to ASME BPVC Section VIII Div.2 for grade 12 titanium materials of ASME SB-338 welded tube and SB-862 welded pipe. The chart for determining shell thickness of components under external pressure developed for titanium grade 12 (UNS R53400), according to ASME BPVC Section II Part D Figure NFT-5.